This town in northern Armenia was nearest to the epicentre of the devastating earthquake of 1988 that was accordingly named after Spitak – even though the death toll at the nearby city of Gyumri was even greater. Today, there's still a grim atmosphere about, even though a lot of relief money has been funnelled towards the rebuilding of Spitak. More background info: The Spitak earthquake of 7 December 1988, which hit just before noon, was one of the worst in the 20th century. It is estimated to have had a magnitude of at least 7 on the Richter scale. Combined with the poor quality of some of the communist era buildings, many of which collapsed like houses of cards, this caused such massive devastation that its scars still show today. At least 25,000 and possibly up to 50,000 people were killed in total by the quake, over a hundred thousand more were injured and about half a million made homeless. Much of the destruction occurred in the nearby city of Gyumri, which was (and is) the area's largest conurbation. Bad relief management in the ailing Soviet Union and the fact that it was the middle of winter made things only worse. On the other hand, help from outside was allowed in, which until then had been a rare thing in Soviet times. And so international rescue teams managed to drag thousands out from under the rubble. Charity events also raised money, e.g. the Rock Aid Armenia effort. Spitak itself was practically wiped off the face of the earth. At least 4000 people perished here alone, nearly a quarter of the current population. The town has since been rebuilt – and you can clearly see the markers of countries where the relevant aid money for the building in question came from. The atmosphere of grimness hasn't gone away, though. And the town's monument and cemetery towering over it remain silent reminders of the disaster. 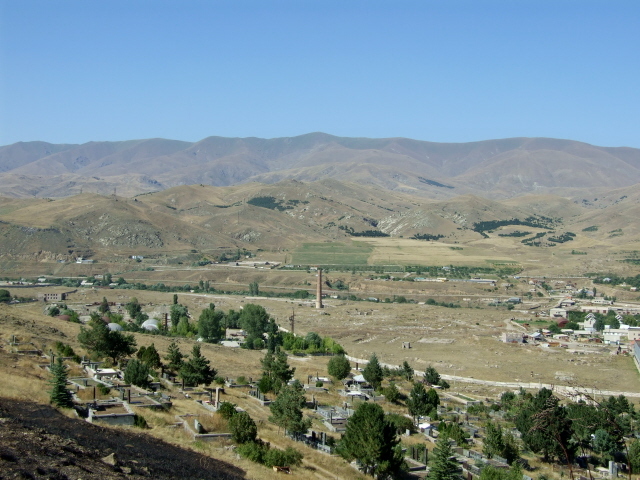 What there is to see: The grimmest aspect of Spitak today is the cemetery on a hill next to the town. At a first glance it may look like any ordinary cemetery but it isn't. Note the images on some of the gravestones – e.g. showing realistic depiction of half-collapsed houses struck by the earthquake. Some graves are for whole families. The strange and eerie chapel, clad in silver sheet metal, and almost windowless (except for tiny slits in the front and on the spire) was built as a makeshift place to pray for the dead shortly after the earthquake – and it still stands as a solemn reminder of the despair in the wake of the disaster. On a hill opposite the one the cemetery stands on you can see the town's monument erected for the earthquake victims. It stands solitary and forlorn … and doesn't look in good shape. In fact it's begun to crumble away. What an irony. The rebuilt town tries hard to have at least a few uplifting touches, which however barely succeed – such as the new town centre plaza with a relief-like monument in its centre. There's also a newly built church – where there is an interesting sculpture round the back ... apparently it was deemed too modernistic to be given a more prominent location. On a nearby hill south-east of Spitak a scarp discovered shortly after the quake clearly showed how the quake broke the Earth's crust. There is a spot you can visit where allegedly geologists located the very epicentre and measured a rift in the Earth's crust going deep down for miles. You can't see that of course – only a strip of rubble on a hillside without vegetation. It could be really just a random patch of small rocks. So you have to engage your imagination to feel the sinister significance of the spot. You won't find this spot without a guide pointing it out to you anyway. I was taken there by the same guide who had taken me all round the region – see the sponsored page for Shirak Tours and the entry for Gyumri. 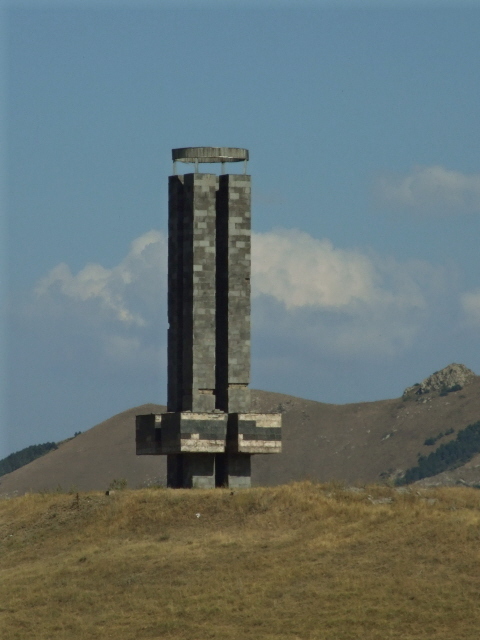 Location: Spitak lies about 25 miles (40 km) east of Gyumri and ca. 12 miles (20 km) west of Vanadzor near the main turn-off of the road down to Yerevan. The cemetery is to the south-east of the town centre on a hillside – you can see the sheet metal chapel from afar. The epicentre measurement spot I was taken to was on a hillside north-east above the neighbouring village of Geghasar about 4 miles (7 km) west of Spitak itself. Access and costs: remote but not too difficult to get to; free (except for guide fees and transport, of course). Details: you can get to Spitak quite easily by simply getting on one of the many marshrutkas (minibuses) that run between Gyumri and Vanadzor. (In theory there's a train option too – but connections are too infrequent and at too awkward times to make this viable). From Spitak itself you'd then need to walk up to the cemetery and the chapel. 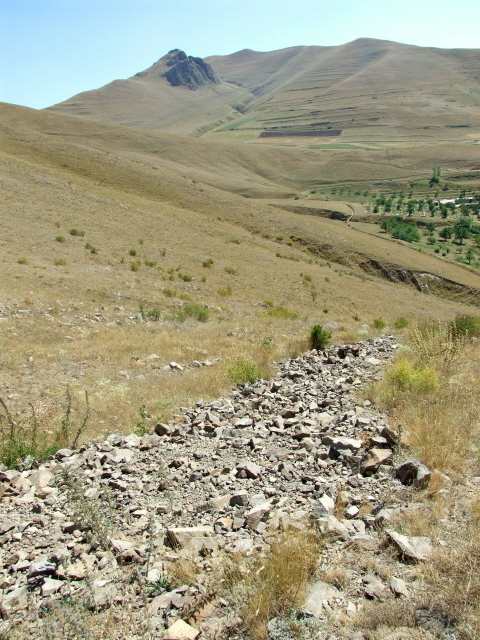 To get to the epicentre from Spitak on foot would mean a serious hike – not so realistic. A better alternative is to get a guide/driver to take you to these places. I can recommend Shirak Tours, based in Gyumri (see sponsored page here). Time required: A look around Spitak and a wander around the cemetery should take no longer than maybe an hour, if that, depending on your mode of transport. If you're on your own, you'll need more time. If you have a guide/driver (see above) then you may also be taken to the epicentre, where you have to climb a hillside, adding another half an hour or so (depending on how fit you are). Combinations with other dark destinations: Most obviously the city of Gyumri to the west of Spitak – which was also badly affected by the earthquake and where many damaged buildings can still be seen today. A different kind of devastation is associated with the city of Vanadzor to the east – in this case it's the legacy of ruthless chemical pollution by the town's sprawling (now mostly silent) industrial plants during the days of the Soviet Union. 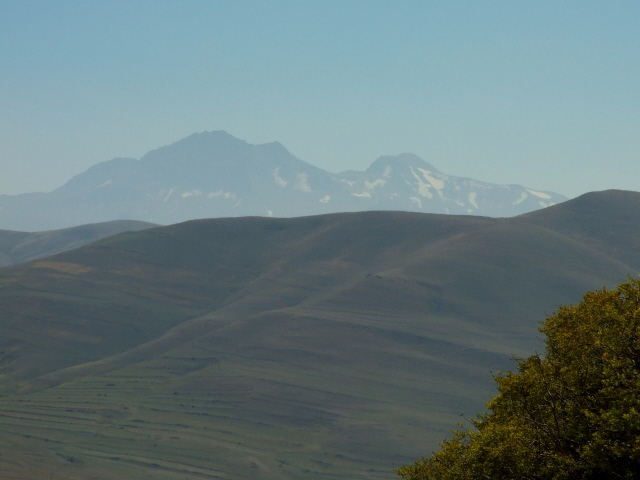 The views from the rough tracks high up in the hills also afford good views of the highest peak in today's Armenia, Mt Aragats (though Western Armenia's Mt Ararat is significantly higher still – but it is now on the territory of Turkey, of course). 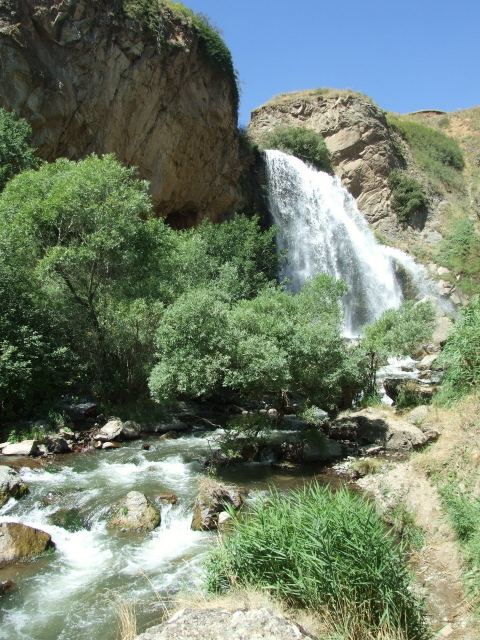 Cultural tourists are best off heading west to Gyumri and beyond – or to the Debed Canyon east of Vanadzor.